Senate Narrowly Confirms Mulvaney As Trump's OMB Director : The Two-Way Democrats who opposed his nomination spoke of Rep. Mick Mulvaney's view that Social Security and Medicare must be overhauled — something President Trump has promised not to undertake. 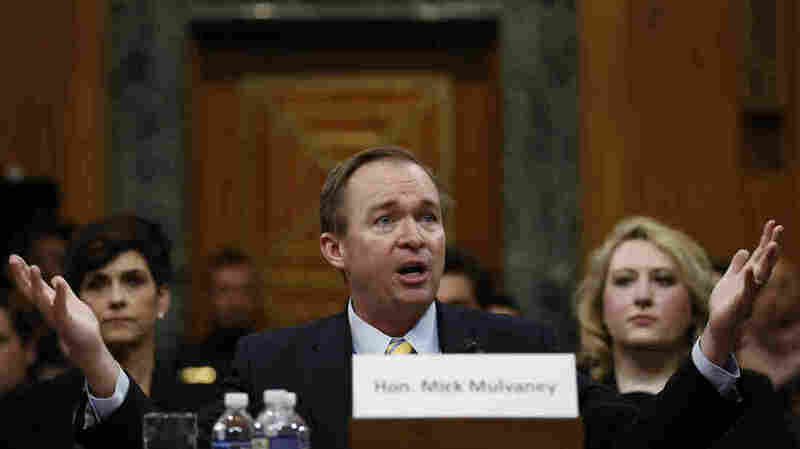 Rep. Mick Mulvaney, R-S.C., faced sharp questions during his confirmation hearings on Capitol Hill last month. Rep. Mick Mulvaney, President Trump's pick to lead the White House's Office of Management and Budget, won a close confirmation vote in the full Senate on Thursday, two weeks after the Senate Budget Committee advanced the South Carolina Republican's nomination by a 12-11 vote. In a back-and-forth voice vote, the tally was 50-47 when Sen. Mitch McConnell's name was called. His "aye" vote sealed the nomination with 51 senators in favor. As the votes rolled in, groups of Democrats and Republicans huddled on the Senate floor, locked in conversation. Immediately after the vote, McConnell took the floor to begin consideration of another Trump nomination — that of Oklahoma Attorney General Scott Pruitt for the post of U.S. EPA administrator. Democrats who opposed Mulvaney's nomination spoke of his view that Social Security and Medicare must be overhauled — a move that, as NPR's Scott Horsley reported last month, Trump promised not to undertake. At least one Republican — Sen. John McCain of Arizona — had said he would vote against Mulvaney's confirmation, in a move McCain said was based on the congressman's position on defense spending. In the past, McCain also faulted Mulvaney for his role in the 2013 government shutdown. Mulvaney "is a prominent member of the House Freedom Caucus, a group of around 40 conservatives that grew out of the Tea Party movement," as we reported when his nomination was announced. In the House, Mulvaney played a prominent role in the shutdown of the federal government over a budget impasse in late 2013. He had advocated for a similar shutdown back in 2011. Mulvaney's confirmation follows a setback for Trump: On Wednesday, his labor secretary nominee, fast-food executive Andrew Puzder, withdrew his name from consideration after failing to get enough support from Republicans.